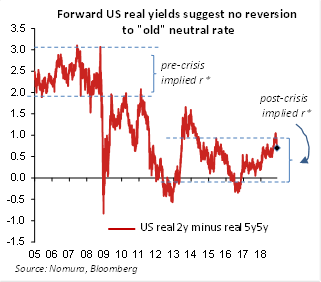 Leaving aside whether US curve flattening or inversion signals a US slowdown, it does at the very least suggest a lower market implied Fed neutral rate. This means that the market is struggling to believe that US neutral rates will revert back to pre-2008 levels. The Fed has also been grappling where the true neutral rate (r*) lies and it seems we are at or in the vicinity of it. What follows then is that US policy rates are above the market implied neutral rate. Put another way, this means that US policy is tight. This should make the Fed more cautious on hikes and adds to the Fed moving out of auto-pilot mode. What is helping this overall theme is the recent weakness in inflation. Yesterday’s ISM report, while strong at the headline level, contained a plunge in the prices component. Moreover, the last PCE inflation report showed a drop in core inflation as well as services inflation. The latter being the one obvious source of inflation in the US. Inflation trends, rather than growth, may therefore be the key data points to observe in the coming months. As for FX, we have seen a big bounce in CNY since the G20 summit (see fourth chart). A trade truce should help China, but it could imply an implicit currency accord (CNY strength in return for the trade truce). US Treasury Secretary Mnuchin implied as much in comments yesterday. Scandi FX and the South African rand also appeared to have been boosted by G20. Others like AUD, NZD, KRW appear to be continuing their trend from before. On the other side, recent winners like INR and TRY have suffered – no doubt hurt by the bounce oil. But the combination of a trade truce and lower US yields would likely benefit other low yielders like the JPY, EUR (and SEK).